Great addition to any 67-68 Mustang! Very nice hood that is actually made of a polymer material stronger than fiberglass. This hood also features a full metal frame, so you do not have to worry about it warping. 67 Shelby style scoop. 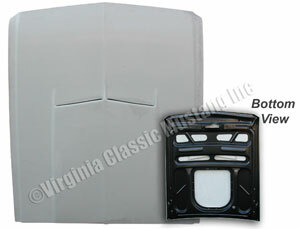 Fits regular 67-68 Mustangs (this is not the longer style Shelby Hood that requires you to also change all the front end pieces.) Designed to be used with stock style hood molding. Hoods are too large to ship by UPS. They must be shipped by Truck Freight (Freight Collect.) Please call for estimate and instructions before ordering.